Turkey tail fungus produces clusters of fans with bands of colors such as brown, orange, tan, black, gray, and blue, calling to mind a wild turkey’s open tail. The fans often have a white or cream-colored edge and are a half-inch to 3 or 4 inches in size. Look for them on hardwood logs and stumps, where the fungus helps to recycle woody material by producing “white rot.” A near look-alike fungus called false turkey tail or leather fungus also grows in the same places. Turkey tail fans are usually white underneath, while false turkey tail fans are brown underneath. With the approach of Thanksgiving, November is a good time to have some fall fun, especially if you have kids in tow, by looking for turkey tails in Westborough’s woods. These turkey tails aren’t feathery or attached to large wild birds. They’re small and won’t run away from you. Find them on logs or dead stumps. In fact, they’re a fungus. Turkey tail (Trametes versicolor) is a fan-shaped fungus that grows in clusters on dead wood, such as the tops and sides of decaying logs. The fans are a half-inch to 3 or 4 inches in size and sport bands of different colors, such as brown, orange, tan, black, gray, and blue. Their overall appearance resembles the fanned-out tails of male turkeys showing off their plumage (something that real turkeys do in the spring breeding season). It’s easy, especially for kids, to imagine a cluster of overlapping turkey tails as a flock of miniature turkeys perched on a log. Some folks even use these fungi as Thanksgiving decorations. Turkey tails are not edible, so they’re never part of the Thanksgiving meal. Where is the main part of the fungus itself? In the case of mushrooms growing on the ground, it’s in the ground. In the case of turkey tails, it’s in the wood. The main part of the fungus is made of lots of thread-like strands that you probably can’t even see. A rotting log is full of them – and they’re the main reason the log is rotting. If you pick a turkey tail fan, you leave the main part of the fungus behind, just as you leave the tree or plant behind when you pick an apple or berry. So what are turkey tails good for, besides inspiring our imagination and occasionally serving as Thanksgiving decorations? Like other fungi, they perform an ecological service: they’re decomposers that help to recycle materials in the natural world. 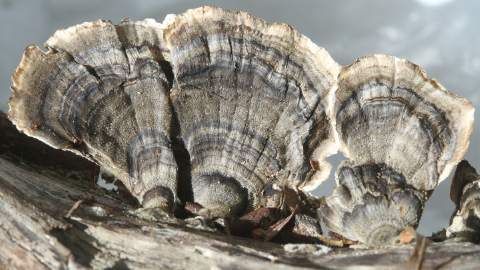 Turkey tail fungus breaks down dead wood into simpler substances, making them available for other living things to use. What would our woods be like if all the trees and branches that came down in hurricane Irene and the late-October snowstorm never rotted away? To find turkey tails, look on logs and stumps from hardwood trees, such as oak and maple. Unlike mushrooms, the turkey tail fans are thin and tough, so they last. You can find them year-round, but their colors are brightest when they’re fresh. Any hardwood forest is a reasonable place to look. Areas where logging once took place are promising because they’re likely to have a lot of leftover logs and stumps. One such area in town is Wile Forest (map at http://www.westboroughcharm.org/guide/maps/libbeywile_trail_map.pdf'). You can also find turkey tails on the Charm Bracelet trail between WCLT’s Hidden Meadow and Long Drive (map at http://www.westboroughcharm.org/guide/maps/bowmanwest_trail_map.pdf) and many other places. Once you’ve discovered a cluster of fans that look like turkey tail, just for fun you might want to check to see whether it’s really turkey tail or a near look-alike fungus called false turkey tail (Stereum ostrea). Both grow on the same kinds of logs. How do you check? Look at the underside of the fans. You won’t see gills, such as you find under the caps of typical supermarket mushrooms and many wild mushrooms. Turkey tail and false turkey tail don’t have them. Instead, both have relatively smooth undersides, but there’s a difference between them. A turkey tail fan is white or light gray underneath, with lots of extremely tiny pores, or holes. You can see them best with a magnifying glass. In contrast, false turkey tail fans are brown and smooth underneath, without pores. False turkey tail is also called leather fungus because of the way its underside looks. All three – gills, pores, and smooth undersides – serve the same purpose for a fungus. They release spores into the environment. In this way, the fungus spreads to more distant locations, such as other logs. Turkey tail is a type of fungus known as a polypore, because of its many (“poly”) pores and other characteristics. Many of the “shelf fungi” or “bracket fungi” that you see growing on tree trunks are also polypores – take a close look sometime. False turkey tail, on the other hand, is a different type called a crust fungus, which has no pores and often grows flat on a surface. Turkey tail’s role as decomposer in nature has inspired research into its possible use in the paper industry. The turkey tail enzymes that digest brown lignin might be able to whiten the wood pulp used to make white paper. Researchers are also investigating medicinal uses for turkey tail, especially in the fight against cancer. Medicine or medicinal tea is made by an involved process that includes thoroughly drying the fans, grinding them to powder, and then extracting certain chemicals with alcohol and water. The process always starts with being absolutely certain of the identification of the fungus, using several technical criteria, so this is not a home project. Some experts think that what we currently call turkey tail fungus may actually turn out to be a group of 10-15 different fungi. Turkey tail can also be used to make blue, green, or brown dyes for wool. It’s tempting to think of mushrooms and other fungi as plants, and they once were considered plants, but no longer. Unlike plants, they don’t contain green chlorophyll so they can’t manufacture their own sugars. (If you see green on turkey tail or false turkey tail fans, it’s usually from algae growing on the fans.) Surprisingly, today scientists think that fungi are more closely related to animals than to plants. One key similarity between animals and fungi is that both get their food from outside their bodies, instead of making their own food. Both produce enzymes that digest food outside of the cells that make up their bodies, and then their cells absorb the nutrients from the breakdown. Fungi release digestive enzymes into the surrounding environment, such as wood, while animals release them into their own tube-like digestive systems. If you hunt turkey tails or false turkey tails along Westborough’s trails this November, you might also spot some of the many other fungi that grow in the woods at this time of year – or even a real turkey!